In Scale by Tim McCue | Fire Apparatus Journal Inc. In Scale is an informative column featuring the latest news and releases of fire truck models and toys. Each issue contains photos of the most interesting pieces available to the collector. Collecting model fire apparatus was once a relatively unknown hobby. Today it has become one of the fastest growing model vehicle special interest groups in the hobby field. 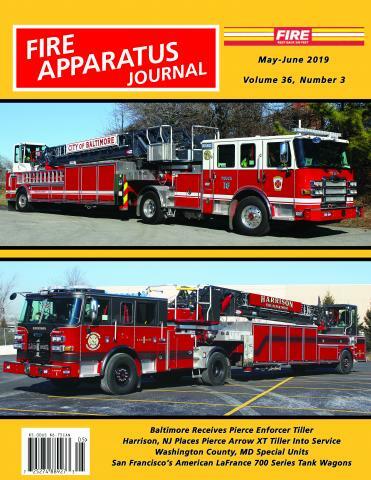 Fire Apparatus Journal is the best source in the industry for this rapidly growing field. Thomas "'Tim" McCue resides in Virginia and has been a Federal Firefighter since 1973. He currently holds the rank of Assistant Chief of Fire and Emergency Services at at Fort Lee, Virginia. He is a certified Emergency Medical Technician and holds Fire Officer II, Fire Instructor II and Fire Inspector Il certifications through the Department of Defense. He has also received training through the US Environmental Protection Agency to the Hazardous Materials Technician level. He has attended the Fire Science Technology Program at Union Community College. He has also served as a volunteer firefighter with the Scotch Plains, New Jersey Fire Department and a a volunteer EMT with the Muhlenberg Hospital Mobile Intensive Care Team. In addition he was a member of the Plainfield, New Jersey, Rescue Squad 1 for thirteen years, achieving the rank of first lieutenant. Tim has been building model fire apparatus and collecting die cast miniature fire rigs since the early 1970's. He currently has a collection of over 1100 pieces of various scales and types. Today Tim still actively collects model and toy fire rigs in all scales although he prefers models in the 1/87th (HO) scale range. Tim is avid supporter of the miniature fire rig collecting hobby and has seen the number of models and realistic looking fire apparatus toys and collectibles available on the market expand tenfold over the past several decades. Manufacturers and "Cottage Industries" are welcomed to provide information on new products to the In Scale column. Readers who have difficulty in finding specific models or who would like to share information and comments are also welcomed to contact Tim at TimFirehouse@msn.com .